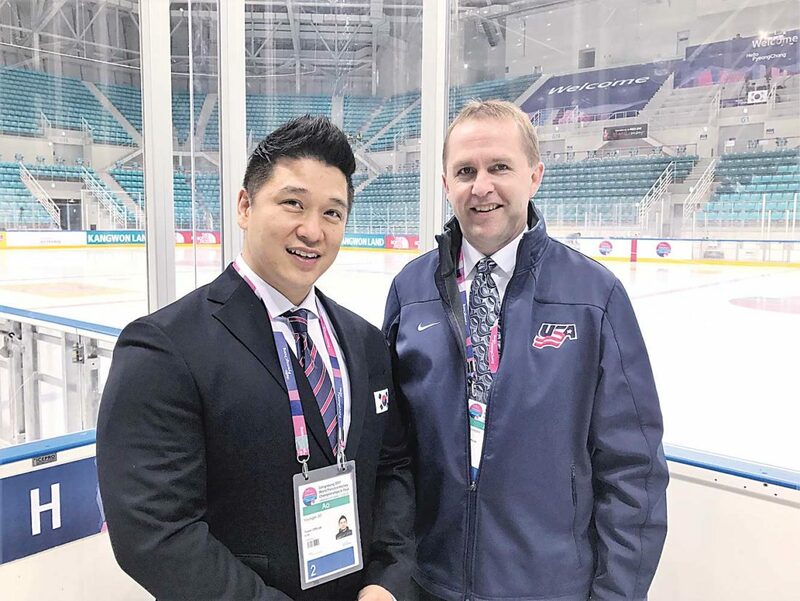 Submitted Photo Hockey coach David Hoff of Bottineau joins a South Korean coach as they stand next to the Olympic ice in PyeongChang, South Korea, during the World Champion para sled hockey games last April. BOTTINEAU – While U.S. teams vie for medals in the 2018 Winter Olympics under way in South Korea, Bottineau teacher and hockey coach David Hoff is helping another U.S. team prepare for a different round of Olympic competition. Hoff is an assistant coach with the 2018 U.S. Paralympics sled hockey team, currently training in Chicago. Along with traveling back and forth between Bottineau and Chicago over the past several weeks, he has traveled with the team to pre-Paralympics games. Hoff has been with the team since late 2016, participating at the team training camps through 2017. He said the Bottineau school has been supportive in allowing him the time to devote to the national team. “My job is to be a high school math teacher and coach. Those are still the important things to me,” he said. Fortunately, the Paralympics organization has been accommodating of his priorities so he hadn’t missed a high school hockey game until last week. He was in Buffalo, N.Y., helping to guide the national team to a 2-1 win over Canada, the main Paralympics threat to the U.S. team that’s won golds the past two games. The XII Paralympic Winter Games will be March 9 to 18 in PyeongChang, South Korea – the same venue as the XXIII Olympic Winter Games. The U.S. para sled team had opportunity to break in the ice at the South Korean arena during the World Champions for para-athletes last April. Their use tested the stadium for the hosts, who were still preparing the venue for the Olympics. Hoff’s association with sled hockey began eight years ago when he was asked to assist at a camp for children with disabilities. It was there he met Jeff Sauer, former head coach at the University of Wisconsin, who helped Team USA to gold medals in sled hockey at the 2010 and 2014 winter games. Hoff’s one regret is not being able to go to South Korea with Sauer, who died a year ago from pancreatic cancer. Head coach this year is Guy Gosselin of Wisconsin, who guided Team USA to a silver medal at the 2017 Para Sled Hockey World Championship. This will be Gosselin’s second Paralympic Winter Games, having served as an assistant coach in 2014. The U.S. team will be arriving in South Korea, a 14-hour trip from Bottineau, a week before the Paralympics to work past the jet lag and get acquainted with the ice. Sled hockey is played much like traditional hockey, with the exception that sleds don’t have backward movement. About a dozen of the 17 team members are returning from the games four years ago. Team members come from across the United States and vary in age from a recent high school graduate to late 30s, Hoff said. Six are military veterans, of whom five lost legs in Afghanistan. Three lost legs due to cancer, and other players are disabled because of birth conditions or trauma events such as vehicle accidents. Whether long-time hockey players or more recent converts to the sport, they are dedicated and display a camaraderie associated with a love for hockey and shared disability. In his 29th year as a high school hockey coach, Hoff said working with disabled athletes has expanded his vision of the sport. “Sometimes I feel like I am the disabled person,” he said, referring to the sense of inadequacy that comes with the challenge of coaching a Paralympics team. He doesn’t see that hesitancy in his players facing even tougher challenges, though. “Their first thought is let’s figure out how to do it,” Hoff said. “They are so strong mentally. That’s one of the great things about being around them.